SPONSORED: Sustainable energy projects are proving better for the bottom line in Kobuk, Savoonga and other villages. Flushing the toilet. Just one of the ordinary luxuries of everyday life people take for granted. But in Alaska's most remote communities, those that are only reachable by barge or plane, this seemingly simple function of modern living suddenly becomes a whole lot more complicated—and expensive. Operation of water and sewer systems in Arctic communities presents unique challenges. With extreme climates, where temperatures can hit 50 below zero, just maintaining a city's water and sewer and sanitation system is difficult. Combine that with extremely high energy use to keep water from freezing and steep operation costs, basic sanitation is a whole lot less sustainable and affordable in rural Alaska. And it's not just the water and sewer bills—which can range in cost from $80 to $250 a month—that see a dramatic spike outside urban hubs in Alaska. There are also fewer jobs to sustain the local economy and a lower median household income. With higher utility costs, residents can be forced to choose between basic sanitation needs and their overall health and wellness. "Sanitation is an important part of our health care solutions equation in terms of providing clean water and sanitary sewer service in order to alleviate health concerns like skin disease and respiratory concerns," said Eric Hanssen, Alaska Native Tribal Health Consortium's Rural Energy Initiative program manager. "There's been numerous studies done that have shown the direct connection between having clean water and reducing the incidence of waterborne disease and skin-transferred diseases." In 2013, the city of Kobuk received funding through the Alaska Energy Authority that allowed the Rural Energy Initiative team and the city to design and install a biomass boiler to heat the city's water system. 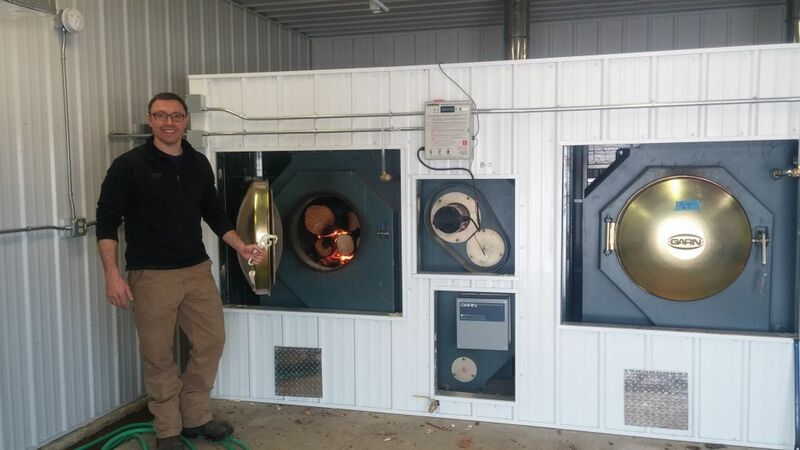 The biomass boiler, which uses locally harvested wood, replaced a costly fuel oil system. Now instead of paying to have fuel flown in, the need for wood creates new jobs for residents and keeps local dollars in the community. It's a win-win for the community in terms of promoting energy sustainability and boosting the local economy. "It gives the water plant operators more hours," said Water Treatment Plant Operator Kris McKay. He and his co-workers spent extra hours at the water plant splitting wood for the new biomass boiler. "Before last winter, we went through 3,500 gallons (of diesel fuel). Last winter, we didn't burn any. It puts the money back into the community." 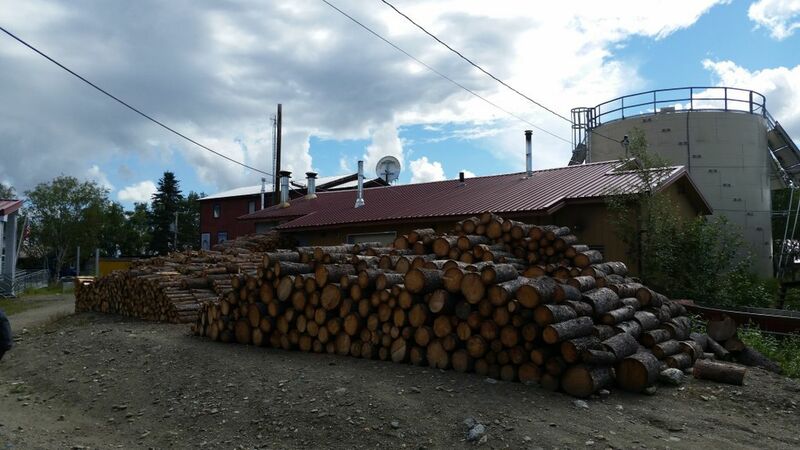 Kobuk’s Water Treatment Plant with more than a year’s supply of locally harvested wood (Photo courtesy ANTHC). When the demand for split wood outstripped the available man hours to split it, McKay asked the borough to buy him a woodsplitter. "We'd spend all day (splitting wood); it's really hard on your body," he said, adding that he's thankful for the new machine splitter. "It's pretty sweet." Since Kobuk's biomass boiler was installed the city has seen an annual savings of $24,000 overall, with $10,500 going back to local woodcutters for their labor efforts in supplying cordwood and $13,500 in direct savings to operating the Kobuk Water Plant. "By lowering the operating cost for the water utility, it allows them (Kobuk Water Plant) to invest in spare parts that they might not have been able to afford in the past, as well as increasing emergency reserves," said Hanssen. "That's another benefit that comes out of the projects that we do—being able to build up those reserves, and then, eventually lowering rates as those reserves meet an acceptable level." Kobuk was not the only rural community that received energy updates through the Rural Energy Initiative. The cities of Anvik, Hughes and Koyukuk also received new biomass systems and savings are projected at an estimated $121,000 in annual energy costs, as well as reducing yearly heating oil consumption by 21,000 gallons. In 2010, ANTHC's Division of Environmental Health & Engineering launched the Rural Energy Initiative, recognizing the great need to work with the state's rural communities to create innovative solutions for running high energy and expensive water and sewer and sanitary systems. The initiative team was tasked with making basic sanitation efficient, sustainable and affordable. "These small communities' sanitation systems have high energy prices and need a lot of energy to operate," said Gavin Dixon, Rural Energy Initiative senior project manager. "It can be quite expensive, especially combined with a limited economy." Hanssen and Dixon are part of a six-person team dedicated to traveling around the state to rural communities and implementing a four-part process to retrofit existing facilities or install new systems. Hanssen said his department collaborates with engineers, designers and field technicians from other divisions. Phase one of a project is the audit—where they collect data, evaluate operating practices and assess a facility's overall energy use. Phase two is back in Anchorage. The team pores over their data to develop an energy model for potential improvements, including materials and costs for updates. Phase three is implementation. The team works with engineers, designers and the community to update a facility, whether that means updates to a current system to make it more efficient or, bringing in a renewable system to reduce operating costs. The last phase of the process is evaluation and monitoring. During the implementation phase, remote monitoring equipment is installed to watch a sanitation system's performance and maintain information on energy use. Eric Hanssen by the city of Hughes’s biomass boiler serving the Water Plant and Community Office Building (photo courtesy of ANTHC). Since the initiative's inception, their work has not only saved the communities they serve thousands of dollars, but also the State of Alaska, through reduced need for payments from the state's Power Cost Equalization Program. According to the initiative's 2015 Annual Report, energy programs completed since the beginning of the program are projected to produce $2,050,000 in annual energy savings rural sanitation systems. "We've got a big focus on where we work with local operators to increase the understanding of energy—how renewable energy integrates into their system, and also things that they can do on their own to improve efficiency and lower cost," Hanssen said. He noted that changes in behavior and water plant operations are often more impactful than hardware improvements, and emphasized how critical training is to ensure energy savings are maintained over the long run. In October 2014, the community of Savoonga was struggling with heat. To be exact, the Arctic community on Alaska's west coast was losing heat. The community's diesel generators were losing up to 70 percent of energy consumed in the form of wasted heat, while only 30 percent of the system's diesel was generating electricity. The Rural Energy Initiative team partnered with the Alaska Village Electric Cooperative and the community to create a heat recovery system that would capture the "wasted" energy that was literally going off into the air. The heat recovery system harnessed the excess heat energy from the local electrical plant, transferring it to the water plant instead of burning diesel fuel. By making this adjustment, both the electric and the water utilities saw substantial savings. From March 2015 Savoonga's heat recovery system has reduced diesel fuel usage by 90 percent. Savings predictions estimate the community will reduce their heating fuel usage by 8,800 gallons, an annual savings of almost $40,000. Biomass and heat recovery systems are just a small piece of the Rural Energy Initiative team's efforts to provide clean water and sanitation systems in rural Alaska. The team works all over the state to install "wind to heat" systems, hydroelectric projects and provide retrofits to outdated systems and infrastructure like dams and water and sewer systems. They're a small team with a simple philosophy: Everybody deserves to have clean water and access to affordable sanitation to improve quality of life. "We're focused on improving the affordability and sustainability of rural sanitation and the health benefits that comes with it. That's kind of the big picture," said Hanssen. "We have a multifaceted program approach tackling this. It's not just renewables, it's not just energy efficiency, it's everything together in a single community to provide the maximum benefit." This article was produced by the special content department of Alaska Dispatch News in collaboration with Alaska Native Tribal Health Consortium. Contact the editor, Jamie Gonzales, at jgonzales@alaskadispatch.com. The ADN newsroom was not involved in its production.